A trip “down south” to chase up some Moto Parilla spares was our main reason for the outing. 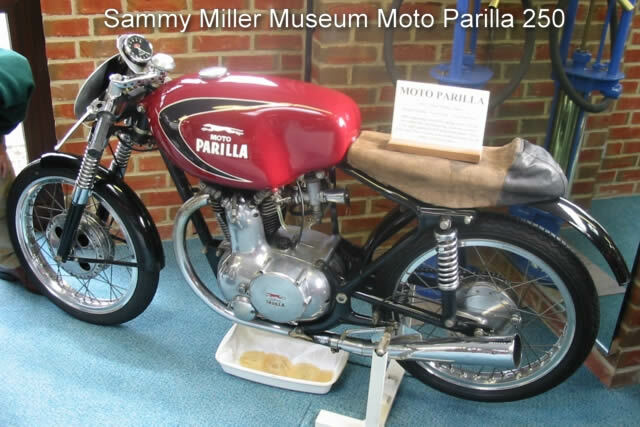 One of the UK Parillistas had mentioned that there was a Parilla “race bike” in the Sammy Miller Museum. Only a bit further away & an ideal way of spending the morning before our p.m appointment to view the spares. We arrived at Sammy Miller’s place not knowing what to expect. 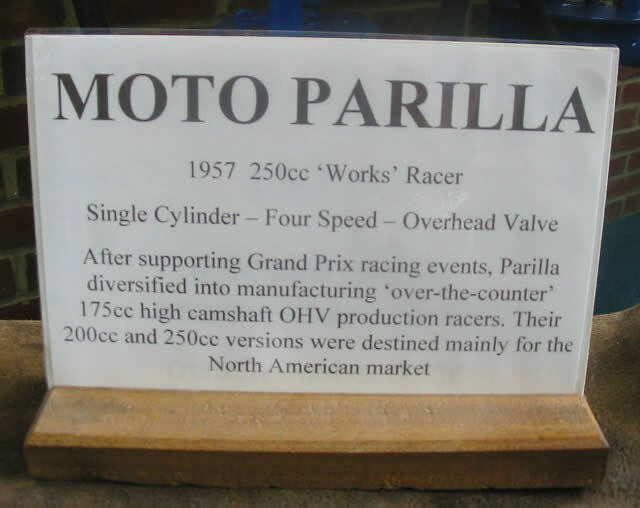 Every Parilla seems to have a racing history especially if it’s missing a lighting kit & someone has found a mega to replace the rusted original silencer. At first sight, the SM museum bike is a little disappointing. Someone has made an effort to “do it up” at some point & a thick layer of paint has been applied to the tank with a pair of horrendous white vinyl dog logos slapped on the sides. The seat is crumpled & the foam collapsed, a big ding in the tank reveals filler beneath the heavy paint coat & a length of threaded rod sticks out of the top rear engine mounting pointing to a hurried engine installation. 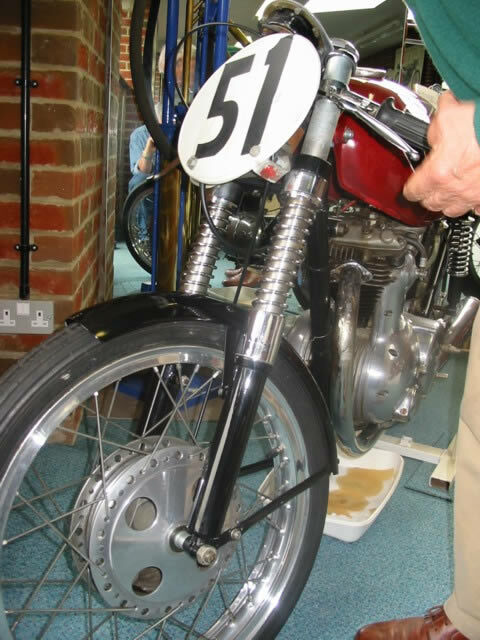 To complete the cobbled together look an ill-fitting rear mudguard pokes out at an awkward angle. Another “wannabe” racer? The museum has made a stab at describing the bikes origin based no doubt on information gleaned from its previous Channel Islands owner. A closer look at the bike revealed some more encouraging signs of its past. 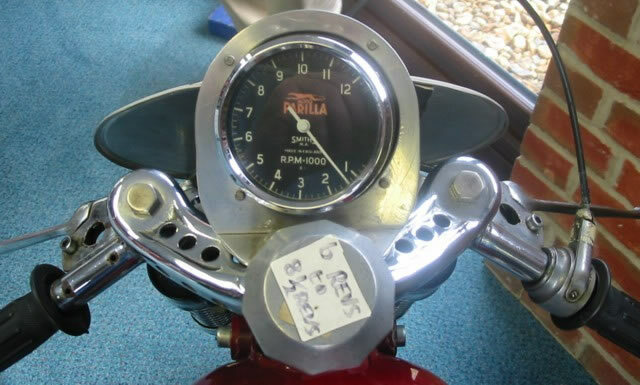 The four-hole front hub, the liberally drilled steel top yoke & a frame cut off behind the rear suspension mounts (not something to do if you were going to fit a long rear mudguard) were all the marks of one of RMs old bikes. 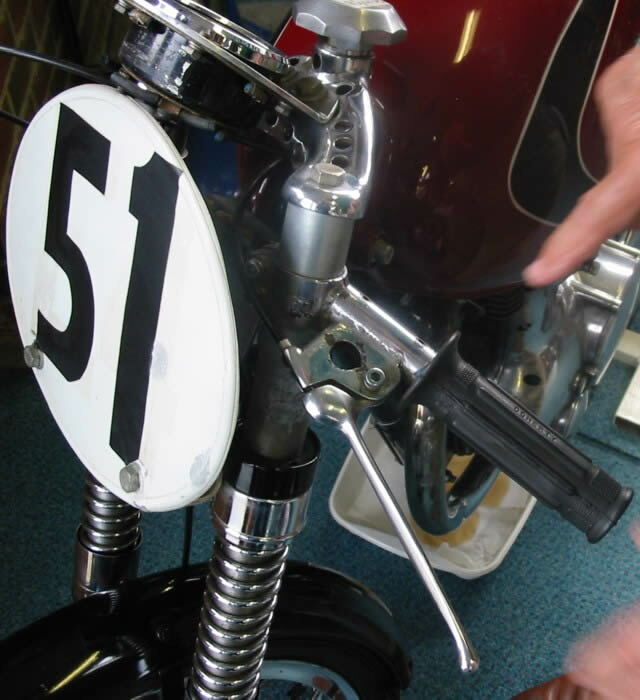 Buoyed up by the findings so far – it was certainly RM’s fork & wheel assembly – we checked out the frame number. It was 250599, the same as RM’s old 256 (350 class) works built bike!!! Elation at finding the old race frame was dampened by discovering that the engine was not the special works unit originally fitted but a numberless 250 road engine, probably a Wildcat or GS. Many of these numberless (ie no 250xxx series number) units were supplied to importers as spares to be fitted as service exchange units. 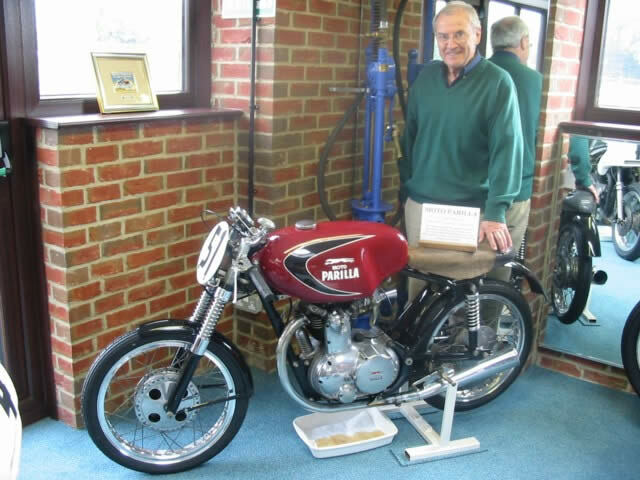 Richard has supplied the museum with a picture of him racing the bike in ’64 & hopefully it will now be restored to more closely resemble its original form & the description plaque amended to reflect its true history. Not a bad day when you are reunited with a bike you last saw some 42 years ago!